The Finnish railway network in 2010. Lines marked in green are freight- and passenger routes, brown are freight routes and grey are no longer in use. The Finnish railway network consists of a total of 5,919 km of railways built with 1,524 mm (5 ft) Russian gauge track. Passenger trains are operated by the private state-owned VR. They serve all the major cities and many rural areas, though railway connections are available to fewer places than bus connections. Most passenger train services originate or terminate at Helsinki Central railway station, and a large proportion of the passenger rail network radiates out of Helsinki. VR also operates freight services. Maintenance and construction of the railway network itself is the responsibility of the Finnish Rail Administration, which is a part of the Finnish Transport Agency (Finnish: Liikennevirasto). The network is divided in six areal centres, that manage the use and maintenance of the routes in co-operation. Cargo yards and large stations may have their own signalling systems. Finnish trains have a reputation for being spacious, comfortable and clean. The scenery surrounding the railway lines is considered to be of outstanding natural beauty, especially in Eastern Finland with its many lakes. Because in most parts of Finland the density of population is low, Finland is not very well suited for railways. Commuter services are nowadays rare outside the Helsinki area, but there are express train connections between most of the cities. As in France, passenger services are mostly connections from various parts of the country to the capital, Helsinki. Currently[when?] there are c. 260 passenger round trips driven daily in Finland, excluding Helsinki commuter rail. Nightly passenger trains only operate on the busiest lines between Helsinki or Turku via Oulu to Lapland (minimum distance of c. 650 km (405 mi.)). This leaves most of the tracks free for nightly freight traffic (c.40 M tons/y)[clarification needed]. In addition there are also good long distance bus and airplane connections, both of which are generally little or a lot more expensive than trains. Buses are sometimes faster and/or cheaper than trains (e.g. Helsinki–Pori). The Finland Railway Bridge across the Neva connected the Finnish State Railways to Russian Railways. The first rail line between Helsinki and Hämeenlinna was opened on January 31, 1862. As Finland was then the Grand Duchy of Finland, a region of Imperial Russia, railways were built to the broad Russian track gauge of 1,524 mm (5 ft). An extension from Riihimäki to the new Finland Station in Saint Petersburg was opened in 1870. However, the Finnish and Russian rail systems remained unconnected until 1912. Russian trains could not have used the Finnish rail network due to a narrower load gauge. Later the Finnish load gauge was widened to match the Russian load gauge, with hundreds of station platforms or tracks moved further apart from each other. Further expansion occurred in the 1800s and by 1900 much of the network had been constructed with 3,300 km of track built. The Finland Railway Bridge across the River Neva in Saint Petersburg, opened in 1912, connected the Finnish State Railways to Russian Railways. Following Finnish independence, the Russian part of the line was handed over to Russian authorities. Since the 1970s the Finnish Transport Agency has been discussing the possibility of building a second railway line from Helsinki to Turku, allowing for a faster journey time between the two cities. This line is known as the 'ELSA' line, as it would pass through the city of Espoo and the towns of Lohja and Salo. An updated feasibility study was undertaken in 2005, and in 2016 the line was included as a policy in the Finnish Transport Agency's report. Plans for a railway line to run east of Helsinki to the Russian border, passing through Sipoo, Porvoo, Kotka and Hamina (known as "HELI-rata" in Finnish) have been agreed in principle by Uusimaa Regional Council. The line would run through an underground tunnel to Pasila railway station and Helsinki Airport before following the route of the E18 road to St Petersburg. More direct lines from Helsinki to Pori and Jyväskylä are also planned. In November 2017 a freight train left Kouvola between Helsinki and the Russian border carrying 41 containers for Xi’an in China. This was the first freight train of its type to travel between the two countries. The 9,110 km journey via Russia and Kazakhstan is expected to take 17 days, compared to around 30 days by sea and rail. This service is expected to become a daily departure in the coming months. The national railway company VR has a monopoly on passenger transport. In Helsinki local traffic, class Sm5 EMUs are owned by Pääkaupunkiseudun Junakalusto Oy, but are operated by VR. The new class Sm6 Allegro trains are owned and operated by Karelian Trains, a 50/50 joint venture of VR and Russian railway company RZD. The trains are operated by VR personnel while on Finnish soil. While private rail operators can transport freight since 2007, most trains are still run by VR. Ratarahti Oy was granted its safety certificate by the Finnish Transport Safety Agency in September 2011 and it will start shunting work at the Imatra rail yard in 2013, with first test runs on 5 December 2012. Proxion Train Oy received its safety certificate in May 2011 and is set to start freight traffic in 2014 after problems with acquiring used equipment from VR. Another new operator, Fenniarail, has found used locomotives in Czech Republic which are convertible to broad gauge, in operation 2016. VR prefers scrapping unneeded rolling stock rather than selling them, in order to limit competition. Used vehicles can't be imported from other countries because of a different rail gauge which vehicles normally can't be converted to. Used vehicles from former Soviet union do not fulfil Finnish regulations. New locomotives are too expensive since they are not constructed for broad gauge. One private railway company exists in Finland, the Karhula–Sunila Railroad, a short branch line with freight traffic only, in Karhula, near Kotka. The branch line is not managed by the Finnish Transport Authority, but by the railway owner. Several museum railways exist that are unrelated to VR Group. Electrification on the Finnish rail network as of 2011. Electrified lines shown in blue. The lines Seinäjoki–Vaasa and Rovaniemi–Kemijärvi have since been electrified. While some private Finnish railways were electrified already at the end of the 19th century, work on the electrification of the main rail network started only in the late 1960s. Most main lines are now electrified. The system used is 25 kV 50 Hz AC overhead wiring, with wire height normal at 6.5 m (21 ft) and varying from 5.6 m (18 ft) beyond 6.5 m (21 ft) to 7.3 m (24 ft). The largest class of electric locomotives are the Sr1 locomotives that were taken into use in 1973. They are now supplemented by the Sr2- and Sr3-class electric locomotives and the high-speed Sm3 Pendolino units. The first electric trains started to operate on 26 January 1969 in Helsinki local traffic, initially between Helsinki and Kirkkonummi and slowly extending to Riihimäki on 31 January 1972. Heading northwards, the electric wires reached Seinäjoki in 1975, Kokkola in 1981, Oulu in 1983, Rovaniemi in 2004, and their current northernmost point in Kemijärvi in 2014. In addition to the line to Kemijärvi, another line recently electrified was the line from Seinäjoki to Vaasa in 2011. The next railway line to be electrified is the railway from Turku to Uusikaupunki, electrification is scheduled to begin in 2019. Running speeds on the Finnish railway network at the start of the year 2011. The maximum speed for passenger traffic is 220 km/h (140 mph), but is achieved only on the Kerava–Lahti railway line. Freight trains have a maximum speed of 120 km/h (75 mph). Actual speed limits vary depending on the train type and track portion. Some delays can occur in autumn and winter due to weather conditions (e.g. high winds). The signalling system used on the railway network in Finland comprises color-light signals and fixed signs. They are used together with ATP-VR/RHK (EBICAB 900), a train protection system usually referred to as JKV (Finnish: junien kulunvalvonta) which has to be used on rolling stock. The system is set to be upgraded to ERTMS/ETCS in the upcoming years, however later than in other European countries due to the low age of the current train protection system. The first ETCS units are set to be installed in rolling stock during 2013, and the first ERTMS signalled portion of track should be opened between 2019 and 2025. Russia – small break of gauge 1,524 mm (5 ft)/1,520 mm (4 ft 11 27⁄32 in). This is within the tolerances and through running is done. Kontiomäki – Kostomuksha — electrified on Finnish side only — Russian side to be electrified at 25 kV 50 Hz AC in 2018-2019. Sweden – break of gauge – 1,524 mm (5 ft)/1,435 mm (4 ft 8 1⁄2 in) (standard gauge); change of voltage 25 kV AC/15 kV AC, however there are no electrified lines that cross the border. Germany – 1,524 mm (5 ft)/1,435 mm (4 ft 8 1⁄2 in) (standard gauge); There are 1,520 mm (4 ft 11 27⁄32 in) train ferries to Sassnitz/Mukran and 1,435 mm (4 ft 8 1⁄2 in) train ferries to Travemünde. Estonia – proposed Helsinki to Tallinn Tunnel, which would be part of the Rail Baltica project (break-of-gauge 1,520 mm (4 ft 11 27⁄32 in)/1,435 mm (4 ft 8 1⁄2 in) at Tallinn for Rail Baltica II). Recently announced ARJ Holdings of Dubai will provide external funding with construction expected to begin in 2020, with 1,520 mm (4 ft 11 27⁄32 in) gauge. Norway – proposed railway line via Skibotn to Tromsø. 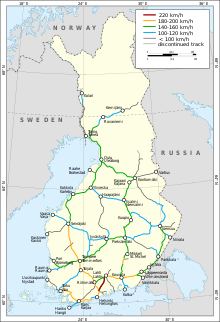 Russia – proposed railway lines from Kemijärvi to Kandalaksha, from Imatra to Elisenvaara, from Parikkala to Elisenvaara, from Parikkala to Sortavala, from Joensuu to Medvezhyegorsk, from Hirvakoski to Kem, and from Kuusamo to Louhi. Sweden – proposed railway line from Vaasa to Tornio via Umeå, Luleå and Haparanda. Russia is the most important adjacent country regarding railway traffic. The freight traffic is much more intensive between Russia and Finland, compared to between Sweden and Finland. There are several daily passenger trains between Russia and Finland, but none between Sweden and Finland. ^ "Missä vika VR?". YLE. Retrieved 24 February 2011. Lähiliikenteessä tehdään 54 miljoonaa matkaa vuodessa. Kaukoliikenteessä tehdään 13 miljoonaa matkaa. ^ Eero Holmila (13 September 2006). "Suomen pisimmän rautatietunnelin louhinta valmistui". Tekniikka & Talous. Retrieved 24 February 2011. ^ "Trafi myönsi toiselle uudelle rautatieliikenteen harjoittajalle turvallisuustodistuksen" (in Finnish). Finnish Transport Safety Agency. 20 September 2011. Retrieved 2 January 2013. ^ Nummelin, Markku (December 2012). "Tasoristeys". Resiina (in Finnish). Museorautatieyhdistys ry, Suomen Rautatiehistoriallinen Seura ry (180): 40. ISSN 0356-0600. ^ "Trafi myönsi uudelle rautatieliikenteen harjoittajalle turvallisuustodistuksen" (in Finnish). Finnish Transport Safety Agency. 26 May 2011. Retrieved 2 January 2013. ^ Nummelin, Markku (December 2012). "Tasoristeys". Resiina (in Finnish). Museorautatieyhdistys ry, Suomen Rautatiehistoriallinen Seura ry (180): 42. ISSN 0356-0600. ^ Alameri 1979, p. 24. ^ Alameri 1979, p. 25. ^ a b c RHK 2009, p. 22. ^ a b Alameri 1979, p. 26. ^ "Electrification of the railway between Rovaniemi and Kemijärvi" (in Finnish). Liikennevirasto (Finnish Transport Agency). Retrieved 29 March 2014. ^ "Electrified lines" (PDF). Finnish Railway Statistics 2012. Finnish Transport Agency. Retrieved 7 January 2013. ^ RHK 2009, Appendix 6. ^ RHK 2009, p. 24. ^ Kymäläinen 2010, p. 16. ^ Kymäläinen 2010, p. 22. ^ Kymäläinen 2010, p. 23. ^ Note: For freight, direct break-of-gauge at Muuga Port, Tallinn, Estonia. For passenger, no direct transshipment hubs, require another transport mode intervening (bus, tram, etc.) between Balti jaam (1520mm side) and Tallinn International Airport (1435mm side). ^ Mortensen, Martin; Nilsen, Kari Stokke (20 September 2011). "Finland positiv til jernbane". Norwegian Broadcasting Corporation (in Norwegian). Archived from the original on 21 February 2012. Retrieved 21 February 2012. Alameri, Mikko (1979). Suomen rautatiet (in Finnish and German). Verlag Josef Otto Slezak. ISBN 3-900134-52-9. F 6/2009 Finnish Network Statement 2011 (PDF). Finnish Rail Administration. 15 December 2009. ISBN 978-952-445-318-9. ISSN 1797-7037. Retrieved 24 May 2011. Network Statement 2012 (pdf). Finnish Transport Agency. 2010. ISBN 978-952-255-603-5. ISSN 1798-8284. Kymäläinen, Heidi (2010). Yhteiseurooppalaiseen junaliikenteen hallintajärjestelmään siirtymisen riskien arviointi (pdf) (in Finnish). Finnish Transport Agency. ISBN 978-952-255-601-1. ISSN 1798-6656. Wikimedia Commons has media related to Rail transport in Finland.